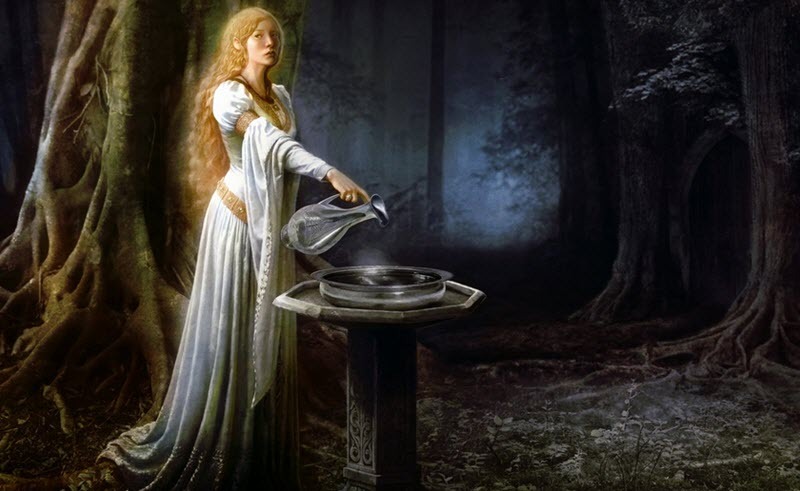 Scrying is the practice of looking into a suitable medium – such as a mirror, a crystal ball or a water-filled bowl – to detect messages or visions. Traditionally, scrying has been used in attempts to reveal the past, the future or possible futures, as well as to receive personal guidance, revelations or inspiration. Scrying has been carried out in many different cultures around the globe, and is still practiced today. Some practitioners believe that their visions come from their own subconscious, while others believe that they come from supernatural sources, such as gods, angels, daemons, spirits or similar. There are no evidence that scrying works but this has not prevented the method to be used by everything from desperate police departments to greedy day traders. Several big banks around the world have tried to use scrying and other supernatural methods to improve their profits while trading. They have always ended up losing money. Which media are used for scrying? A wide range of media are used, and have been used, for scrying. The preferred media vary a lot between different cultures and also between individual practitioners. The chosen media tend to be reflective, refractive, translucent or luminescent, but this isn’t always the case. Some scrying media readily suggests imagery, e.g. the shapes and figures naturally formed in a log fire. Other media distort or reflect the scryer’s vision. There area also scrying techniques that involves reducing visual stimuli to very low thresholds. Some scryers simply look into the dark or up towards the sky, or close their eyes, notionally “looking” at the inside of their own eyelids. Some practitioners assert that the scrying medium, such as a crystal ball exposed to light, help them focus attention in the same way that repeating a mantra or concentrating on a mandala would. Once they have entered a state of intense focus, free association can be carried out with the perceived images. In some traditions, psychoactive plants are utilized by the scryer to facilitate or aid in the scrying process. On the other end of the spectrum, there are practicioners who strictly prohibit the use of any psychoactive substances (weak or strong, natural or artificial) in association with scrying, claiming that their presense invalidate any image or vision experienced by the scryer. A widespread European practice, which is still (more or less seriously) carryed out today, encourages young women to gaze into a mirror in a darkened room to catch a glimps of their future husband. If the girl is destined to never marry, she will see a skull in the mirror instead of the face of a living human. In many traditions, this scrying can only take place on a certain night, e.g. New Years Eve, Midsummer’s Eve or All Hallows’ Eve. There might also be certain ceremonial actions that the girl has to carry out right before the scrying, such as walking backwards up a dark flight of stairs in complete silence. In the Bible (Old Testament), a silver chalice is described as being used by Joseph for scrying. This chalice is placed in Benjamin’s sack before he leaves Egypt, to make it easier for him to pass himself off as an Egyptian nobleman. Scrying was a practice well known at the time. It was an important aspect of Egyptian culture, but forbidden by Hebrew law. In Persian mythology, the Cup of Jamshid is a cup used for divination. According to legend, it was owned by the rulers of ancient Greater Iran. There are many Persian stories and poems where this cup and its powers are mentioned, and many author states that the success of the Persian Empire hinged on this cup and the proper usage of it by the ruling monarch. Legends tell us that the Cup of Jamshid had been found in Persepolis and that it was filled not with water but with an elixir of immortality. By looking into this liquid, the scryer could observe the seven layers of the universe and reveal deep truths. Josepth Smith, founder of the Latter Day Saint movement, claimed to have obtained religious information from the reflections of seer stones. Smith had at lest three seer stones, of which his favorite one was a brown stone that he had come upon while excavating a well for a neighboor. At first, before he founded a religious movement, Smith used his seer stones to try and find treasures. He would place a stone in his hat and then put his face into the hat, creating a darkish space where he would engage in scrying by staring at the reflections of the stone. According to Smith, he had access to a set of spectacles composed of seer stones. These, he called Urim and Thummim. It was only by looking through these stones that he could accurately translate and understand the golden plates that would become the source for the Book of Mormon. The French apothecary Nostradamus (Michel de Nostredame) used scrying when writing his famous predictions abotu the future. He would look onto either a bowl of water or a mirror and fall into a trance in which future events was allegedly revealed to him. His most famous work is the book “Les Propheties”, a collection of 942 poetic quatrains about the future, first published in 1555. In, several of the old Mesoamerican cultures, mirrors were used for scrying and were also believed to be symbolically connected to the sun. These traditions have survived into our days, with some contemporary Mesoamerican healers using mirrors, jade balls or glass balls for scrying. In some parts of Mesoamerica, such an object is known as a zaztun. 1 Which media are used for scrying?